1961 has brought many changes to the world. Yuri Gagarin, the Soviet cosmonaut became the first man in space. In the United States, John Kennedy took office as the 35th president and that same year committed the nation to “landing on the moon by the end of the decade” with NASA’s Project Apollo. The UK lawyer Peter Benenson launched the “Appeal for Amnesty” which gave birth to Amnesty International and a global movement for human rights. In Germany, construction of the Berlin Wall – a symbol of a divided nation, began. Alan Shepard made the first US space flight. Niagara Falls started to produce hydroelectric power, and IBM introduced its first Selectric typewriter Golfball. (TWA) Trans World Airlines became the first airline to offer its passengers in-flight movie screenings. Politically, socially, and economically, the world was moving at a warp speed. And Bavarian Motor Works had its own history in the making – BMW 700 RS – the apogee of German engineering of its time. Let’s start from the beginning though. Bavarian Motor Works or Bayerische Motoren Werke was born on March 7, 1916. A little over a century ago. The history of the eminent automaker began with manufacturing superior aircraft engines. After the WWI, following the Treaty of Versailles, which limited German aircraft manufacturing, BMW expanded its production to motorcycles. And in 1923, the world saw the revolutionary twin-cylinder R32 motorbike. In fact, the new motorcycle was so efficient that the 1923 motorbike concept is still used in modern day BMW motorcycles! But it wasn’t until 1928, when the company acquired the Automobilwerk Eisenach, that the miniature BMW Dixi hit the trail. While the car’s design was borrowed from the Austin Motor Company, Dixi was the company’s first automobile that paved BMW’s way into motorsports history. Officially, BMW’s romance with racing commenced on June 14, 1936, when Ernst Henne drove a BMW 328 to win in its first-ever race at the Eifelrennen at the Nürburgring in Germany. Then followed victories in RAC Tourist Trophy, La Turbie hill climb, Mille Miglia to name just a few. When the World War II broke out, BMW ceased making vehicles for the civilian market to free up assembly lines for military production. Following the war, the Allies took control of the BMW plants and dismantled them. The company began to produce pots, pans, and other kitchen utensils only to stay afloat until it could reinstate assembly of cars and motorcycles in the early 1950s. In 1951 a roomy 501 model debuted in the post-war market. Then came the 502 boasting the light alloy V-8 engine. In 1955, the quirky Isetta won the hearts of the public. Then in 1958, Ernst Hiller drove the slick and classy 507 roadster, bringing the BMW a triumphant win in the Austrian Grand Prix. But all that was not enough to help the company recover from the post-war depression. The sales weren’t substantial enough, and to survive, the automaker needed a miracle. And it got one! The 1959 BMW 700 came to rescue. The 700 was like a breath of fresh air. It looked nothing like its predecessors – minimal in its design and easy on the pocketbook. Rear mounted, air-cooled boxer twin originally had 30 horsepower. It was the most robust engine the BMW could supply at that time. Designed by the masterful Giovanni Michelotti, the new model featured a feather-lite monocoque body. The car’s lightweight technology provided the qualities required for good acceleration, with the top speed of 78 mph, and hill-climbing performance. Debuting at the 1959 Frankfurt Auto Show, the car was very well received by the German public. In the new model, the drivers saw a low-cost alternative to the ubiquitous VW Beetle. The company sold more than 35,000 BMW 700 units in 1960, which accounted for 58 percent of total revenue. Finally, the luck was on BMW’s side. The car’s featherlight, aerodynamic body was its gateway to the racetrack. In 1960, the fast Coupe brought home both gold medals and titles. The company arranged for glorious Hans Stuck to drive its humble 700 to win the German Hillclimb championship and six other races. Needless to say, the car’s popularity skyrocketed, so did the demand for a more powerful engine. The 700’s heartening success on the racetrack inspired the BMW engineers to build a car specifically for racing. The idea of the BMW 700 RS came from Heinz Eppelein, an engine development specialist. Determined to make the idea a success, some of the best engineering masterminds chimed in – Ludwig Apfelbeck, Willi Martini, and Alexander Von Faulkenhausen. Baron Faulkenhausen, an ex-bike engineer with the first-hand experience in racing, was the backbone of BMW motorsports efforts and led the company’s racing department until his retirement in 1975. At the time the RS idea was born, the racing department had a scant budget. Nevertheless, it still managed to hand-build two 700 RS roadsters in just four months. The new racing car borrowed its axle from the existing 700 Coupe together with the rear window, which, in the RS, was used as a front windshield. Headlights and rear lights came from Bogward Isabella, and the Amadori magnesium cast wheels were from Italy. Rainer Furchtenicht and Gottlieb Koch welded together a steel tube chassis frame, which later was dressed in a beautiful aluminum body shell by Willi Huber. Ludwig Apfelbeck did his magic converting a motorcycle-based two cylinder of only 697 cc into a tire-burning Kettenhund. The completed RS was 136.4 inches long, 57.5 inches wide, and 41.7 inches high. With its engine, 5-speed gearbox and drum brakes, the car was 650 kilos/1433 lbs light and developed the top speed between 150 and 200 km/h ( 94 and 124 mp/h). The original, Apfelbeck’s Kettenhund engine soon proved unreliable, and in 1962 was upgraded to M106 capable of up to 80 hp. Rumor has it that a third engine version was developed in 1964. But it was only used once by von Falkenhausen in chassis #2 when he raced for the last time in his career at Neubiberg in August 1964. Only two BMWs RS 700 were ever built – chassis #1 and chassis #2. The roadster made its first public appearance on June 18, 1961, at the Rossfeld Hillclimb Race, where it rivaled with the likes of Porsche Spyder and Porsche RSK. The petite RS 700 was minimal in its design, but deadly in competition, bringing BMW numerous victories on the track. Both chassis were raced extensively. The RS 700 was driven by Stuck, as well as von Falkenhausen himself, Heinz Eppelein, and Heinrich Hülbüsch. Hubert Hahne had this beastly roadster to thank for the majority of his victories. Both cars were eventually sold to Willi Martini. There is a discrepancy though, as to when exactly the chassis #1 and chassis #2 left the BMW factory ownership. Some sources claim BMW held on to the RSs until 1964, others insist Martini purchased them as early as 1963. Either way, change of ownership didn’t mean the end of the racing career for the beastly roadsters. Martini competed briefly before retiring both chassis in long-term storage. In the early 70s, the chassis #2 was bought back by the BMW, restored to its original condition, and is available for viewing at the BMW Museum in Munich today. Martini decided not to hold on to chassis #1 either and sold it to a private collector from Minden, Wolfgang Franz. Across the ocean, in Atlanta, Georgia, Elliot Butler made it his lifetime dream to one day own the BMW 700 RS. After having located his long-desired car, he spent long one year and a half negotiating back and forth with Franz. And finally, in 2000, the car sailed for Georgia, where Elliot refurbished it and started the engine for the first time after long 14 years of stillness. 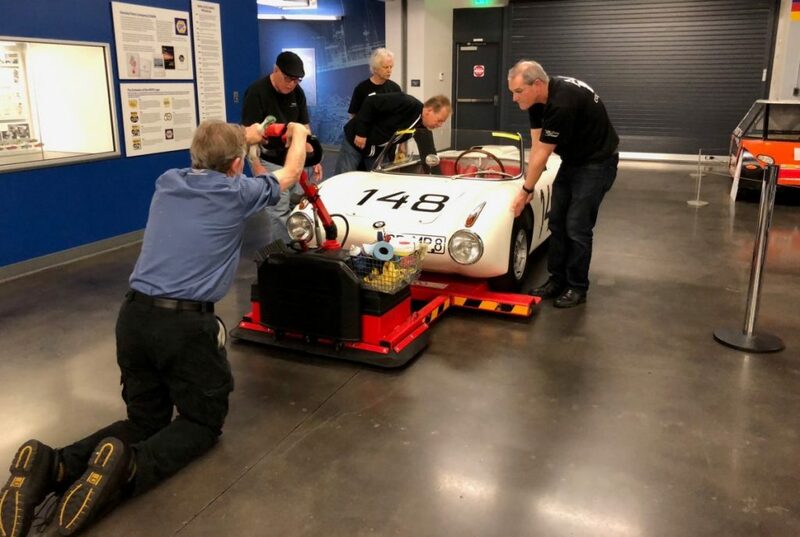 The chassis # 1 changed hands once more, and now rests in a remote shop in Southern California. Its current owner prefers to stay anonymous and refers to himself as The Collector. The RS ownership came with one condition – the car must remain in the hand of enthusiast, it can never be sold back to BMW. The RS 700 chassis#1 is a truly unique car, one of only two ever made. Once, the masterpiece of BMW engineering, it was the fastest, best equipped, minimal, yet best looking, and sharpest handling car on the track. For many, it ignited their love for motorsports and automobile in general. Today, Corsia Logistics gets to be a part of this car’s history. We felt humbled when the RS 700 current owner approached us to arrange shipping of his historical treasure to Le May – America’s Car Museum for the Heroes of Bavaria: 75 Years of BMW Motorsport. Transporting the petite 700 RS – meant transporting a unique piece of the BMWs history, the marque, whose mere utterance evokes thoughts of class, exclusivity, and impeccable design that will last for years to come. 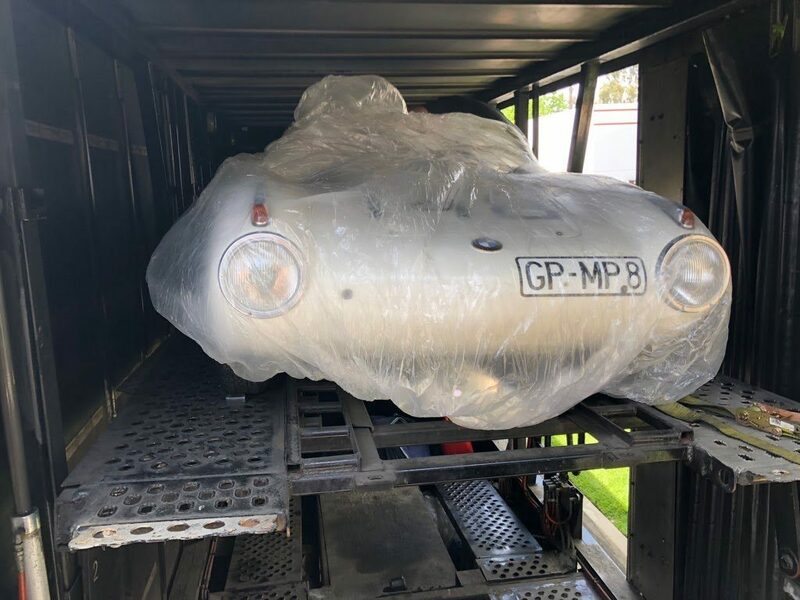 The unique RS 700 roadster traveled in a fully enclosed trailer, carefully handled by our team of auto transport professionals. It arrived intact at Le May – America’s Car Museum, where it’ll be admired by those who share the passion for the BMW brand through May 2019.